Twenty-five years before, Lucky Starr’s parents had been destroyed during a pirate raid on the Terrestrial Empire. Lucky had since brooded, awaiting a chance to avenge their deaths. Now the vermin of space once more threatened the empire’s safety and tranquility. The time for sweet vengeance was near. Lucky was at the helm as his space ship, the Atlas, was being readied for takeoff. The Luna City exhaust pit yawned as the ship’s main rockets blasted their fury into it. Slowly and with majesty the Atlas lifted and moved upwards, its speed increasing, its mission underway. It pierced the black sky, shrinking until it was only a star among stars, and then it was gone. 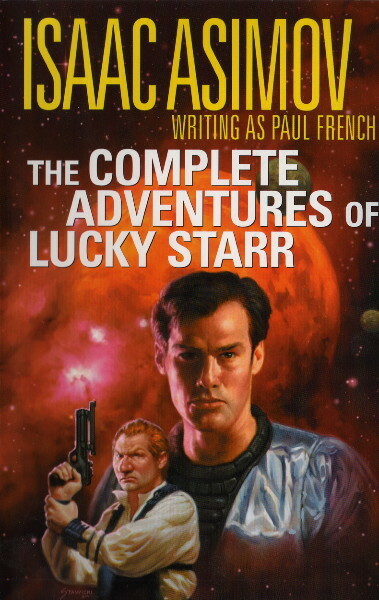 This, the second book in the “Lucky Starr” series, resembles nothing so much as the first. As in David Starr: Space Ranger, our intrepid hero goes undercover to investigate nefarious goings-on. Along the way, he runs into two men who are obviously bad guys, one of them (Captain Anton) in a supervisory role and the other (Dingo) just a straight henchman and as nasty as they come. Lucky and said henchman get in a fight which Lucky wins despite the deck being stacked against him, all this pretty much straight out of David Starr: Space Ranger. As before, he also meets one other man, in this book a hermit named Joseph Patrick Hansen, who appears to be nice and sympathetic, but who turns out in the end to be the novel’s main villain. The chapters are short, the pace is relentless, there’s more action than is usual for Asimov, but the whole thing remains pretty cerebral. Like the other Lucky Starr books, it’s an excellent book for a boy into adventure stories (or a girl into adventure stories, I suppose, although that was certainly not the audience anybody had in mind when these were published—in fact, except for a brief flashback involving Lucky’s mother at the beginning of the novel, it has no women at all). Adults in search of a fun story to fill an idle hour or two should enjoy it as well. One odd feature of this book is that Lucky and Bigman spend most of it separated. Lucky infiltrates the pirates while Bigman stays behind, Lucky investigates the pirate base while Bigman stays behind, and Lucky rushes across the solar system while Bigman stays behind. It isn’t that Bigman doesn’t have anything to do—he provides diversions, rescues Lucky, and takes the occasional potshot as needed—but it’s a bit odd for the to sidekick to spend so much time not kicking at the hero’s side. What makes Lucky Starr and the Pirates of the Asteroids well worth examining, however, is the way in which the text undermines the book’s basic premise (or at least the title) and the insight it thereby provides into how Asimov approached the craft of fiction writing. Now, if I’m Fred Pohl, Asimov’s agent at the time, and I’m trying to sell something called “Lucky Starr and the Pirates of the Asteroids” to a Hollywood producer, said producer will come up with a mental picture of what those pirates will be like—especially a 1953-vintage producer. Basically, one would expect something like Treasure Island or Captain Blood—in space! That is not, however, what Asimov delivers. As would happen later with Fantastic Voyage, Asimov’s drive to get things right means making a world which is much richer (and better) than the Hollywood stereotypes. For example, let’s start with that most obvious of pirate tropes, the buried treasure. Hansen is a retired pirate. Are his ill-gotten gains hidden on some asteroid somewhere? Can the location only be determined by a mysterious map with a big X on it? Well, no, actually. In point of fact, after Hansen’s enforced retirement, he took his money to Earth, invested it, and has been living very comfortably off the proceeds. How about the pirate lifestyle? Do they roam the space-lanes in their ships, looking for fat merchant vessels to prey on? Do they occasionally put in to some disreputable port for a week’s debauchery, wine flowing freely and women of the night plying their trade? Again, the answer is no (especially with regard to the women). What little raiding is going on is pretty much restricted to the main asteroid belt, where there frankly isn’t that much traffic, and even then most of the pirates don’t participate. Rather, they stay back on the various pirate bases where they do mundane things like tending the yeast vats. That is to say, like the “cowboys” in David Starr: Space Ranger, these men are high-tech farmers, plain and simple. In fact, these gentlemen insist that they aren’t actually pirates. Rather, they’re the “men of the asteroids.” Now, in part this is just a matter of people giving themselves a flattering name—your terrorist is my freedom fighter, after all. Still, these are not the scum of the earth, out to take what they want and waste it on low living. No, they’re the marginalized and dispossessed, men who don’t have anything to gain by staying in the inner solar system and who have struck out into the asteroids in the hopes of making a life for themselves. In terms of recent pop culture, then, we’re dealing with Mal Reynolds here and not Jack Sparrow. Unfortunately, “Lucky Starr and the Men of the Asteroids” just doesn’t have the right ring to it—but that’s what we end up getting. To lower the odds of Hollywood taking an interest in Lucky Starr even further, the book ends with the revelation is that not only is Hansen a pirate, but he’s the pirate who killed Lucky’s parents twenty-five years ago. This is Lucky’s chance—the desire to avenge his parents is one of the things driving him, after all, and fate has given him the opportunity for that vengeance. So what does Lucky do? He sends Hansen off to jail—actually, he sends him off to negotiate with the Sirians and then off to jail. Again, this is very much against the code of the Hollywood pirate story. In Hollywood, even if you’re going to bring him back for the sequel, you need to kill Barbarossa off, preferably on-screen. It is very much in line with Asimov’s own moral code, however. Lucky gets his job done and sends the villain off to jail because that’s the kind of guy Asimov admired, Hollywood be damned. Even worse, Lucky’s known for practically the whole book who Hansen really is, but he’s willing to forego revenge for the sake of the greater good. For Lucky, killing the man who murdered his parents is far less important than preventing a war between the Earth and Sirius. 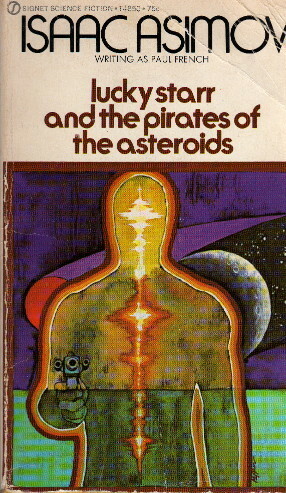 As for the science, Pirates of the Asteroids has probably faired better than any of the other Lucky Starr books and needs no revision to match current planetary astronomy. Oh, sure we’re told that the asteroids are the vermin of space, and that is hyperbole at best, but there are no asteroid thickets à la The Empire Strikes Back, and asteroids aren’t actual menaces to navigation in and of themselves. We do get to find out that there are “forbidden zones” where asteroids simply are not found because of Jupiter’s gravity—and that’s even a plot point. By and large, however, Asimov gets away with not having to update the science through sheer dumb luck. He recites pretty much everything that astronomers knew about the asteroids in the early 1950’s—roughly how many asteroids there are, how big they are, and how the main asteroid belt formed. It’s just that in the time since, astronomers have had to revise very few of their earlier ideas about asteroids. Oh, we’ve learned a lot, to be sure. We just haven’t had to unlearn very much along the way. He does end up being wrong on one bit of asteroid lore, however, although not seriously so. Asimov says, “There were the four largest [asteroids], each a hundred or more miles in diameter. There were fifteen hundred more that were between ten and a hundred miles in diameter. After that there were thousands (no one knew exactly how many) that were between one and ten miles in diameter and tens of thousands that were less than a mile in diameter but still as large or larger than the Great Pyramid.” Current estimates are that there are some 750,000 asteroids with with diameters of at least 1 km, 90,000 at least 5 km across, and 10,000 at least 10 km across, so he’s fairly consistently low by about one order of magnitude. All things considered, that’s pretty good. Certainly it’s better than canals on Mars or a planetary ocean on Venus. Terminology, of course, has done a little alteration in the past sixty years, but, let’s face it, “Lucky Starr and the Men of One Dwarf Planet (and Maybe a Second) Together with Thousands of Minor Planets Orbiting the Sun Between Mars and Jupiter” would be a terrible title. Asimov fares less well with technology. He himself noted in his essays the irony that virtually nobody in science fiction anticipated just how much computers would end up doing for us, and the further irony that he himself spent so much time writing about artificial intelligence and still managed to miss just what it could do. Between computerized orbit calculation, computerized record keeping, and robotic surveys of the sky, as of August 2011 there are over half a million asteroids with known orbits in the main belt alone, according to the IAU Minor Planet Center. They do have unstable orbits, and we are still losing and finding them, but I doubt that by the time we can build a ship like Lucky’s private little boat, the Shooting Starr, it would be easy for someone to take refuge on an asteroid whose position and orbit were not being tracked. At the end of the book, Hansen and Captain Anton are high-tailing it to Ganymede, where their Sirian sponsors have set up a base. (Poor Dingo has been executed for failing to kill Lucky. Twice. Twice failing to kill Lucky, that is; he wasn’t executed twice, attractive though that prospect might be.) If Anton’s ship isn’t stopped, war is certain to break out between Sirius and Earth. I’m not quite sure I follow Asimov’s logic here. The Sirians have been deliberately provoking Earth into making a major military strike against the asteroids, and since the main pirate base in the asteroids is on one side of the sun and Earth and Ganymede on the opposite side, such a military strike would leave Earth very vulnerable to attack. Fair enough—only, now that Lucky and the Council of Science know this, why not simply shore up Earth’s defenses or tell the Sirians that the jig is up? The brains behind the pirates is on his way to Ganymede, and his base in the asteroids can be found at any time, so there’s no real need to stage Earth’s attack immediately. And so what if Hansen makes it to Ganymede? His physical presence can’t mean that much, and any information he has on Earth’s woeful lack of preparedness can be radioed ahead, as can any assurance he might give that the men of the asteroids are ready to do their part in the Sirian war against Earth. If anything, his not being on the scene back between the orbits of Mars and Jupiter hurts the pirates’ chance to do anything significant when Sirius strikes. Lucky guesses that Anton and Hansen will be staying in the asteroid belt as long as they can on their way to Ganymede. That will give them about one billion miles to travel. Lucky, however, will try to intercept them in the Shooting Starr by crossing the Solar System in an almost straight line, so he will have only six hundred million miles to go. He’ll also take advantage of the Shooting Starr’s much greater acceleration, keeping it at well over 1 g almost constantly, something Anton’s ship certainly cannot do. Let’s assume that Lucky is maintaining 2 g acceleration. He’s got 960,000,000 km to travel. If he doesn’t care how fast he’s going at the end, it would take him three-and-a-half days to cover the distance and about five days if he slows down to match Anton’s speed. If the pirates can manage only 1 g acceleration, and allowing for the fact that their final goal is landing on Ganymede, meaning they’ll have to match its velocity, they’ll need slightly over nine days’ travel time. Since Lucky catches up to them just before they reach Ganymede, that means that they have something between four and six days’ head start. The book is vague on how much time elapses between their departure from Ceres and Lucky’s, but the general impression is that it’s only a matter of hours. Four days is possible, but it seems somewhat unlikely. Six is completely out of the question. Of course, the real reason behind this scenario is to get Lucky to fly perilously close to the sun—within five million miles and actually within the sun’s corona. Now, the problem with the corona is that it doesn’t exactly end, it just kind of fades out. It’s surprisingly difficult to find out just how far from the sun you have to get before you don’t think of yourself as being “within the corona” anymore; I’ve seen some definitions that would have the corona extend all the way out to beyond the orbit of Neptune. I’m not enough of an astronomer to know for sure, but if you’re going to say the corona extends five million miles from the sun, there’s really nothing to keep you from saying that it extends one hundred million miles from the sun and therefore beyond Earth’s orbit. That is, I think that Asimov is stretching a point to say that Lucky is flying within the Sun’s corona. The problem of just how the Shooting Starr can accelerate at such rates for days on end is not addressed. Asimov tends not to deal with fuel issues in his science fiction; it’s part of the general suspension of disbelief in his writing. It’s rather hard not to think of it in this setting, however, especially since he has brought up the existence of fuel depots on various asteroids over the course of the book. All this, however, is completely beside the point. Here we have Asimov at the peak of his form, writing something which is light and a little on the silly side, but still a lot of fun. This is definitely a book which is worth a look, especially for someone who wants an insight into the Asimovian art of writing science fiction.